Adding meta description..!! Yes, right friends now i am showing you how to add it in blogger blog. You know meta description is the most important part of SEO which are containing the site means homepage description and post description with keywords. As a blogger, you should know nowadays blogger made it very easy to implement meta description in blogs and every blogger is trying to use it properly for better SEO. A good quality post is a soul for a blog or website but it is not enough for having blogging success. You must use properly on page SEO for a better consequence of your blogs. Meta description setting is one of the best on page SEO and it also provides to search engine about your blog post description and keyword results. It is an HTML or XML element which tells search engine crawler's about webpage also home page, post and pages of your blog. When you share your post in social media as like facebook, twitter, google plus, Pinterest, linked in then it provides search result and post description with your share. Just write a properly meta description by this way you can ranking your post on top of the page in search engine. Blogger platform is powerful for blogging if you just use it properly with the right way to including meta tags, meta keywords and meta description. Recommended: How To Add Page Number Navigation Widget For Blogger. However, here I will show you just meta description settings with 2 steps. Step one is starting now. Adding Meta Description in Blogger For Homepage. First of all, you need log into your blogger account. Now click on Setting option first. Then click Search Preferences, Like Bellow Screens Shoot. Now Meta Tags then Description and click the Edit link. Click the Yes radio button. Now "write a description in a way which best describes your blog or website's contents. Just make sure that they are bellow 150 characters with spaces". Now you have successfully done by enabling meta description for your blog home page. Adding Meta Description To Individual Posts and Pages. After finished the Step One now I am explaining Step Two and here I describe setting of meta description for each post and pages individually. When you write a post or make a page you can see as like bellow image on the right site. Now click on Search Description and "write a description of your post that properly tells what is the post is all about and what the visitor will get". Remember that it will not appear unless you have followed Step One. And That's it. Now you are successfully done for adding meta description to blogger blog. I appreciate that following this post to blogger blog sites for best SEO. Now I just show you an example with a screen shoot, Look at this image here. 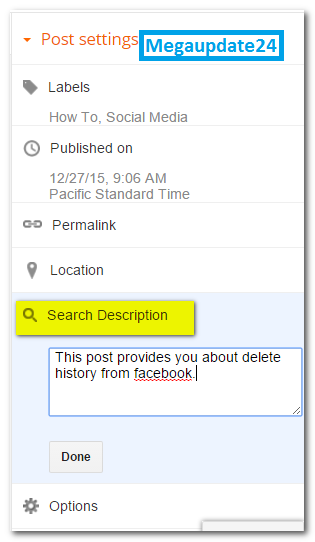 In this post, I used the main keyword that is Delete History and sub keyword was Facebook. You look like carefully, You can see my post keyword is bold on the search engine. I must sure that it is possible for a nice Quality post and good Meta Description. Hopefully, you enjoy it and learn at least something from here. If any question please don't forget to inform me via comment.